Astoria. Queens, New York. It’s not quite as “exotic” as living in Thailand, Laos, or Cambodia, but the melting pot of cultures and the traditional community-like nature of Astoria provide an extraordinary maze of hidden gems to explore in the neighborhood. There are Greek bakeries, 24/hour fresh markets, and ethnic restaurants aplenty in Astoria – but in my expeditions around the neighborhood I’ve found some truly unexpected spots nestled in between traditional Queens establishments. Here are my top 3 Astoria hidden gems so far – all near the N/Q train on 31st street between Broadway and 31st Ave. The outside of this store looks like any old-fashioned, cheap fabric shop. What drew my eye was an array of quirky, cheap jewelry displayed outside. I figured I’d duck inside and see if any of the fabrics would serve as curtain inspiration. Inside, I was shocked to find an array of quirky art prints, jewelry and other crafty miscelenny front and center, surrounded by the expected bolts of fabric. Hangable wooden blocks hand painted with celebrities’ faces, including that of the late David Bowie, were for sale in a bin on the counter. I bought 2 adorable framed prints ($15 a pop!) to decorate my new apartment. This store is a true Astoria hidden gem, and unless you happen to stumble in, you’d never have a clue as to what quirky wonders are inside! I love that a store that has clearly been a neighborhood staple for decades has reinvented itself to support local artists and attract hip young thangs like myself, while retaining it’s traditional visage and not alienating its original fabric-shopping clientele. Walking down Broadway in Astoria, you’ll see a wide array of trendy restaurants and bars nestled between classic neighborhood staples, delis, butchers, bargain shops, markets, etc. My favorite hidden surprise was this Terrarium shop. Beneath the awning of a neighboring bodega, Crystal Gardens is easy to miss if you’re not paying attention. Inside a tiny glass storefront on the corner a pink backdrop accentuates hanging glass orbs filled with plants and colored sand. I mistakenly went into the deli next door on Broadway, trying to get inside Crystal Gardens for a closer look, but the man at the counter informed me the entrance was right around the corner. I didn’t have time to stop in, but I will definitely be back! I clearly wasn’t the first to find the shop notable – I found an article in the Huffington Post about the store owners, Mexican actor Gilberto Gonzalez and Dominican chef Onesis Castillo – a refreshingly far cry from the waifish kids who seem to run all the little crafty shops in Brooklyn. I can’t wait to buy one (or some) terrariums to furnish my Astoria apartment. I love this cafe. In fact, I am writing this very post while seated at the lone stone table in the center of the little shop. Madame Sou Sou certainly hits you over the head with quasi-French charm. 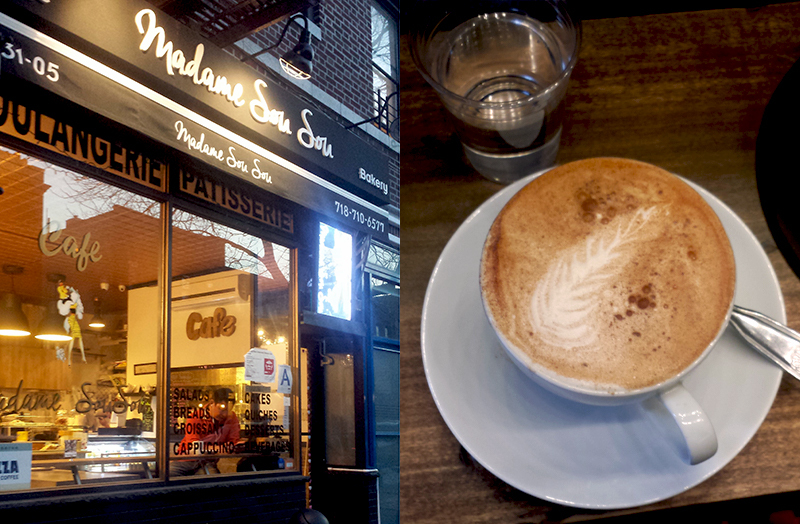 There is an array of baked goods, sandwiches, and salads, and the server makes one of the best Chai Latte’s (Ok, the prettiest) this side of the East River. Well, this coming from someone who has only been sipping Chai Lattes in Queens for a couple of weeks. There are pretty hooks to hang your coat, it’s well enough lit but atmospheric, the WiFi is strong, and the French music is pleasant without being distracting. Patrons can dispense their own water into well-sized plastic cups, and there is an outlet in the corner, easily accessible from a few different spots around the small cafe. The bathroom is clean, has chic furnishings, and the walls are covered in real photographs from around the world. A steady flow of international visitors of all ages adds to the ambiance. It seems that no detail has been overlooked here. It’s a terrible place, don’t come. Seriously, stay away. It’s mine! But if you must stop by for a hot, frothy drink, make sure to say hello.